Giving back to the community is a great way to connect with others! There are a variety of children within our community that need help. 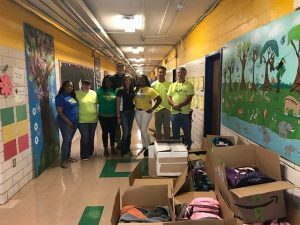 Harlem Park Elementary/Middle School in Baltimore City, Maryland were in need of school supplies and clothing for their students. Anderson Fire Protection, Inc. (AFP) and Hamel Builders came together and provided school supplies for 200 children. Two hundred backpacks were delivered and were filled with school supplies along with boxes of folders, binders, etc. We also provided the students with shoes and jackets for the upcoming winter months. Ms. Logan the school Principal and all the teachers appreciated our efforts in providing students with the necessary supplies for the academic year. AFP and Hamel believe that it is so important to recognize the needs of our community and help in any way possible. Our children are our future. They need to have the necessary tools to obtain a good education. Here are just a few more reasons why you too should consider giving back to the community in any way you can. Gaining skills, knowledge, and expertise are just a few of the common side effects that come with volunteering and giving back. In fact, giving others your time shows them that you care about their success. And we all know how important education is to the future leaders of tomorrow. Investing our time and energy into students is the best way to ensure that they become prosperous and capable leaders in the future. Whether you are brand-new to the city or have been here a long time, being social is essential for everyone’s well-being. In fact, volunteering is an excellent way to cultivate your inner social butterfly and spread your generosity to those who need it most. Doing something for the community that you live in can be incredibly rewarding. In fact, volunteering is a way to show appreciation for your community. There is absolutely no greater feeling than being able to give back to others, especially children who are in need to school supplies so they can succeed in the classroom. Anderson Fire Protection is more than just a fire protection company. Giving back to the community is integral to our company. We have the expertise and skill to help your home or commercial property upgrade to the latest smart smoke detectors. We have been working in the Maryland, Northern Virginia, Southern Pennsylvania, and Washington, D.C. areas for over 25 years, and we are known for our top-notch customer service and high quality results. If you are ready for fantastic fire prevention and protection services, from fire sprinkler installation to fire alarm design and consulting, give us a call at (410) 796-4915 or visit us online. For more fire safety tips to keep your property safe, follow us on Facebook, Twitter, LinkedIn, and Google+. This entry was posted on Friday, September 29th, 2017 at 8:51 am. Both comments and pings are currently closed.